Briny fresh scallops paired with with the cool closed buds of winter's light-sheltered bitter greens. Now that we are in the height of the season for both endives and scallops, why not consider a tarte? - Prepare the pastry and set it to chill. - Slice the onion thin. - Melt the duck fat in a saute pan, and add the onions and garlic, let them sizzle for 10 minutes over medium heat, tossing frequently, making sure that if they begin to turn brown, you lower the heat, avoiding them turning brown as much as possible. - Add the shredded mushrooms and chicken, turn up the heat and toss and cook until the mushrooms release their liquid and things begin to take on a crispy browned edge. - Toss the herbs in, and toss over the heat for another 3 minutes. - Add 1/4 cup white wine and cook until the mixture is soft and glistening, the liquid reduced. Season with salt, pepper, and ground fennel. - Wash the outside of the endives. Cut off the base end, and then slice them into wedges approximately the thickness of your scallops. Tip: Vary the thickness of the endives slightly to allow their differences in height to add to the visual impact of the tarte. - Roll out the pastry, and lay it into to a baking dish. - Spread the onion/mushroom/chicken mixture around the base of the pie shell. - Arrange the sliced endives and scallops over the onion mixture, thinking about slices, to make sure each of 8 slices will give your guests at least one scallop. - Sprinkle sugar over the scallops and endives. - Slice the butter thin and scatter it over, making sure to get some butter on the scallops (see photo). - Bake in a hot oven (400F/200C) for 25 minutes, allowing the endives and scallops to begin to brown. - Remove the tarte from the oven, and lower the heat to 350F/180C. Drizzle the chicken stock over the tarte, cover tightly with foil, and return to the oven for another 15 minutes. Heaven. This looks like nothing short of heaven. This recipe is ideal as a whatever-is-in-the-fridge sort of meal. For example, I only sometimes have duck fat on hand...but I do have a ready supply of reserved bacon fat. And I can see this working without chicken too, in a pinch. Lemon thyme could be a lovely substitute. Lots of possibilities! Scallops and endive are a classic combination. I love them together but haven't been able to convince the chef at our Bistro Des Copains to do them on the menu ... yet. I like the tart idea will have to do that for lunch at home. I would have a hard time interesting my family in the combination of endive and scallop; unless cheese is involved endive isn't enjoyed very much. Perhaps a substitution of braised lettuce? Perhaps also CA endive is more bitter than French? A small note on the poached pears: I made them twice once with a Rhone red with sugar and cinnamon and once with a sweet red vermouth without the cinnamon They were both very good, but the (bonus) prize went to the granita I made with the leftover liquids from the vermouth batch....a soft subtle flowery pear taste and aroma... very refreshing and different! I never would have thought of putting those two together, but now that you mention it... looks amazing! Thanks for coming by, I appreciate your comments. So beautiful... Like little rose buds. What a beautiful, winter menu. Inspiring, too...the scallops always frighten me but maybe now is the time to jump in. I wonder what the trick is for making them for a crowd? Hmmm...maybe they are just for an intimate-sized dinner. An amazingly pretty tart ! 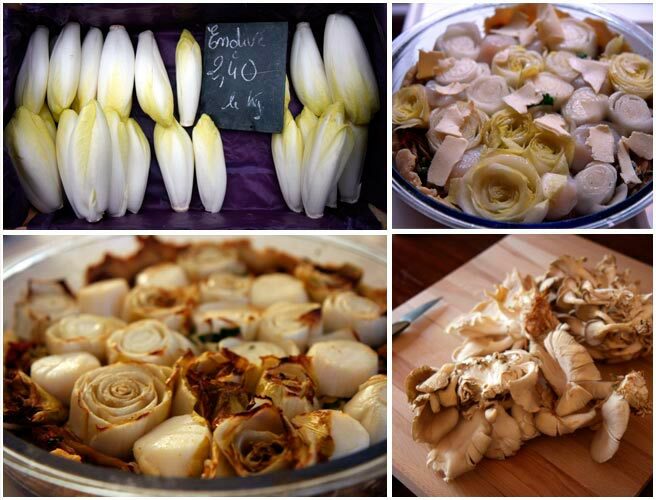 And endive is always a favourite , a Dutch staple , in fact ! A beautiful tarte, Lucy, giving me much food for thought - so to speak. I hope little Ian is doing well now. Thank you for the wonderful comments, we enjoyed scallops again tonight for dinner, 3 times a week for awhile now -- Christine, Ian is doing great! He's fine now after a few days of battling it out. I love them well together, but have not been able to convince the Chief at our Bistro Des Copains to menu... again. I like the idea of tangy should do this for lunch at home.